Think about managing and categorizing the Hosts. Thank you for publishing this part! i'm so glad you are such a good teacher. Hi Mr.Rezvani Thank you for teching Zabbix. 1) I create a list of oid's with Solarwinds MIB Walker and I don't know how set setting in zabbix for alarm if drive C in Windows Werver less than 10% free space? 2) Can you create another greate video for add map and image in zabbix and how can work it? Thank you for every thing. 2- I am thinking about last video for the Beginners series. Perhaps I do it.. Which software you use to write and show in the tutorial videos? In Microsoft PowerPoint, in the presentation view you can use your mouse as a pen, although I have an old pen which I am using it. There is no specific software is required. I have installed zabbix 2.4 on ubuntu 14.10, but when I try to retrieve information via SNMP from a mikrotik rb 951, I can't fetch such information for port ethernet because there is no such variable name in this MIB. 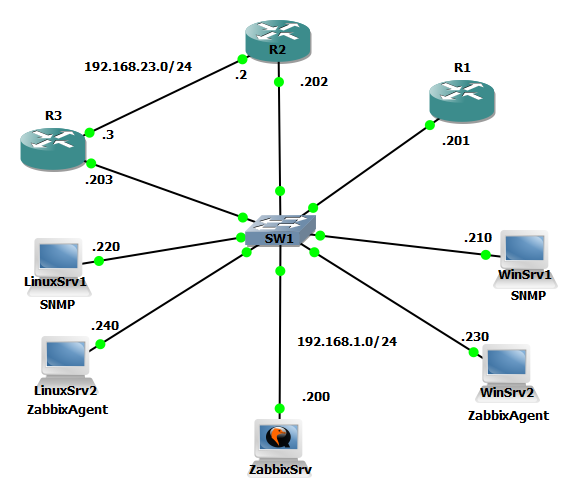 Actually in general you have two ways: Using SNMP templates which are covered at "http://www.cbt4all.com/2015/02/zabbix-for-beginners-03-working-with.html"
Second is using exact SNMP OID which is covered in "http://www.cbt4all.com/2015/01/02-zabbix-for-beginners-working-with.html"
and do you have plans on making more videos, specially on zabbix ?? 1- can you post a videos on how to create maps with interactive icons (ex: the router icon turns red if cpu threshold exceeded + sound alarm generated ? 2- Does Zabbix has a tree structure to display graphs similar to cacti trees ? 1- In general the answer is Yes. But: I am planing for the appropriate approach for the blog. So, although I hope one day I have the opportunity of covering all Zabbix feature, I don't think it happens early. Also, these videos are for beginners, like me, and your question may will cover in the advanced Zabbix which I have planed for the future. You can ask the question in Zabbix Forum or check the documentation to get quick answer. 2- I dont have so much idea about Cacti, but if you mean you need dependency in devices, yes Zabbix support it. For example if Router1 is down, all of the links which are connected to Router1 are down and the "main" and "root" problem is Router1. Again this feature hopefully will cover in Advance Zabbix. I have a question for zabbix advance training! Thanks for your comment and I am happy that you like the videos. Thank you for this very helpful videos. Is there any way we can automate the discovery of the hostname and use this as a visible name automatically instead of using the IP address as the visible name? Hi, thanks for your comment and appreciate for the feed back. I will try to fix the problem for the videos in the future. I saw your videos on Zabbix (most particularly the auto-discovery part). I create my auto-discovery and I have now my 4 categories : CISCO ; JUNIPER ; Linux Servers and Windows Servers. Now I want to subdivise thoose categories into sub-categories (CISCO Switches, CISCO Routers ...). How can I do that ? Could you give me just some advice so I can start working on it ? I think I'm gonna find by myself but I don't have a lot of time .. Thanks for really useful tutorial. I am totally new in Zabbix and you videos are really helpful. I have a question regarding to host "is it possible to sett *all* the hosts' inventory to 'Automatic'? " Hi, it's possible i use at LLD SNMP two communities? Please also possible to show us how to add an extra MIB files for SNMP monitoring of extra devices, like raid cards, or other which use a special MIB files.